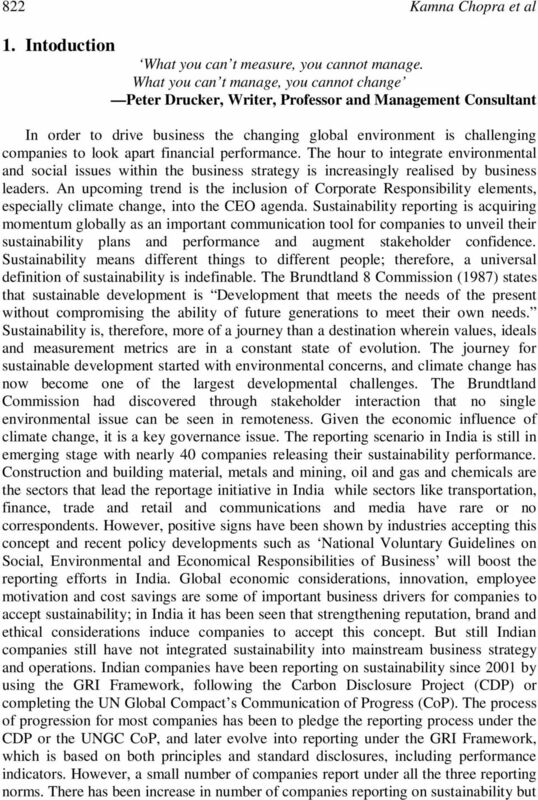 Download "A Study on Sustainability Disclosures and Reporting Trends in India: An Analytical Validation"
1 Global Journal of Finance and Management. 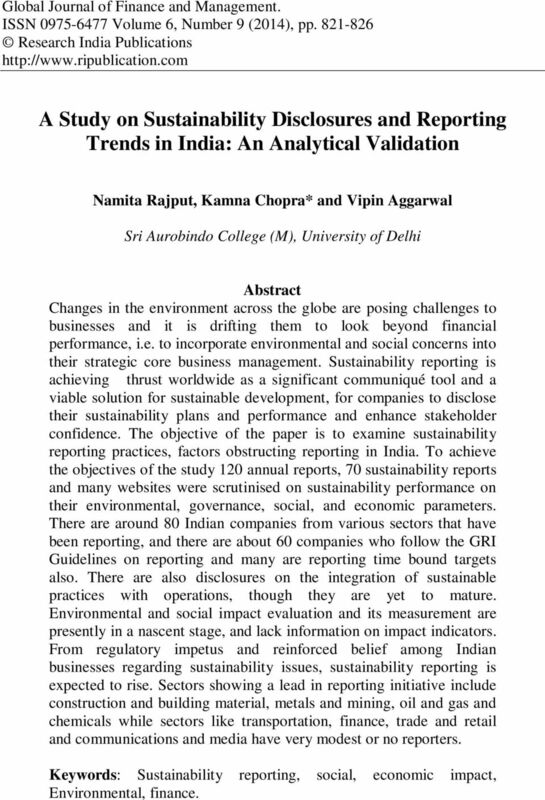 ISSN Volume 6, Number 9 (2014), pp Research India Publications A Study on Sustainability Disclosures and Reporting Trends in India: An Analytical Validation Namita Rajput, Kamna Chopra* and Vipin Aggarwal Sri Aurobindo College (M), University of Delhi Abstract Changes in the environment across the globe are posing challenges to businesses and it is drifting them to look beyond financial performance, i.e. to incorporate environmental and social concerns into their strategic core business management. Sustainability reporting is achieving thrust worldwide as a significant communiqué tool and a viable solution for sustainable development, for companies to disclose their sustainability plans and performance and enhance stakeholder confidence. 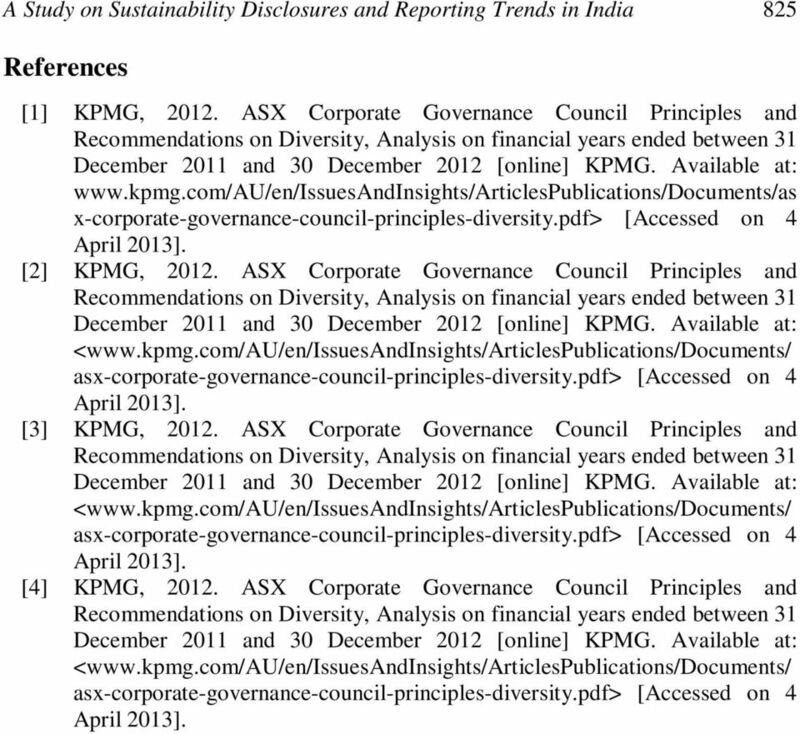 The objective of the paper is to examine sustainability reporting practices, factors obstructing reporting in India. To achieve the objectives of the study 120 annual reports, 70 sustainability reports and many websites were scrutinised on sustainability performance on their environmental, governance, social, and economic parameters. 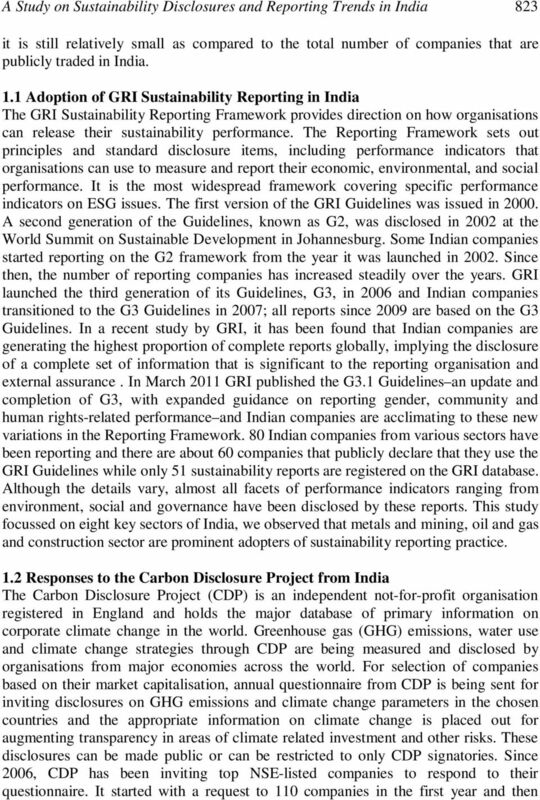 There are around 80 Indian companies from various sectors that have been reporting, and there are about 60 companies who follow the GRI Guidelines on reporting and many are reporting time bound targets also. There are also disclosures on the integration of sustainable practices with operations, though they are yet to mature. Environmental and social impact evaluation and its measurement are presently in a nascent stage, and lack information on impact indicators. From regulatory impetus and reinforced belief among Indian businesses regarding sustainability issues, sustainability reporting is expected to rise. Sectors showing a lead in reporting initiative include construction and building material, metals and mining, oil and gas and chemicals while sectors like transportation, finance, trade and retail and communications and media have very modest or no reporters. Keywords: Sustainability reporting, social, economic impact, Environmental, finance. 4 824 Kamna Chopra et al expanded the sample to NSE 200 from 2007 onwards. Companies have now started responding to not just those issues related to investors but also supply chain-related questionnaires. An increasing trend of third party assurance specifies the reliability of disclosures and validates credibility of the organization to its stakeholders. Arising out of the need for verified data, the Carbon disclosure project has recently released a roadmap to increase the number of companies submitting verified data. 2. 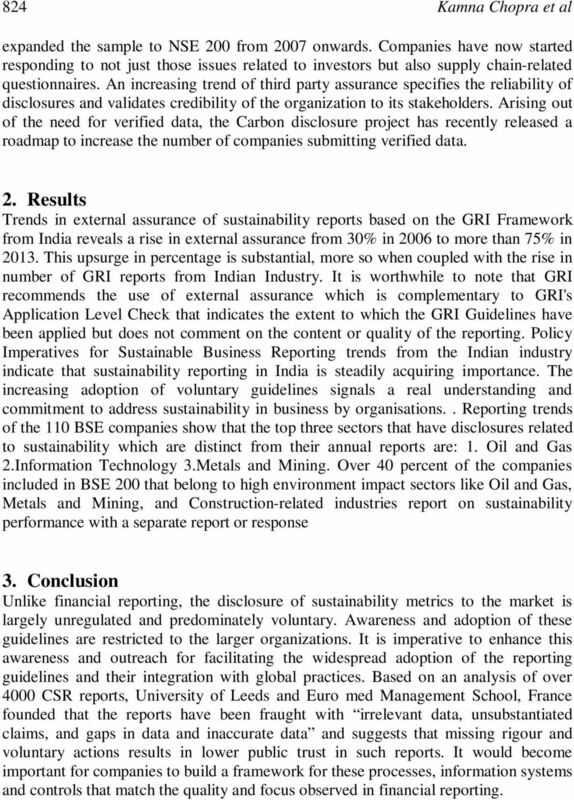 Results Trends in external assurance of sustainability reports based on the GRI Framework from India reveals a rise in external assurance from 30% in 2006 to more than 75% in This upsurge in percentage is substantial, more so when coupled with the rise in number of GRI reports from Indian Industry. It is worthwhile to note that GRI recommends the use of external assurance which is complementary to GRI's Application Level Check that indicates the extent to which the GRI Guidelines have been applied but does not comment on the content or quality of the reporting. Policy Imperatives for Sustainable Business Reporting trends from the Indian industry indicate that sustainability reporting in India is steadily acquiring importance. The increasing adoption of voluntary guidelines signals a real understanding and commitment to address sustainability in business by organisations.. Reporting trends of the 110 BSE companies show that the top three sectors that have disclosures related to sustainability which are distinct from their annual reports are: 1. Oil and Gas 2.Information Technology 3.Metals and Mining. Over 40 percent of the companies included in BSE 200 that belong to high environment impact sectors like Oil and Gas, Metals and Mining, and Construction-related industries report on sustainability performance with a separate report or response 3. Conclusion Unlike financial reporting, the disclosure of sustainability metrics to the market is largely unregulated and predominately voluntary. Awareness and adoption of these guidelines are restricted to the larger organizations. It is imperative to enhance this awareness and outreach for facilitating the widespread adoption of the reporting guidelines and their integration with global practices. Based on an analysis of over 4000 CSR reports, University of Leeds and Euro med Management School, France founded that the reports have been fraught with irrelevant data, unsubstantiated claims, and gaps in data and inaccurate data and suggests that missing rigour and voluntary actions results in lower public trust in such reports. It would become important for companies to build a framework for these processes, information systems and controls that match the quality and focus observed in financial reporting. Capital markets in the dark: an unsustainable state of play Better Business Reporting kpmg.com.au Foreword Sustainability reporting originated around 20 years ago, initially as environmental reporting. CICS Quick Guide to the Benefits of Product/Service Carbon Footprinting What is a Product Carbon Footprint? A product carbon footprint is just what it says it is the carbon footprint of a product (or service). We set the standard for Impact Investing and are the first-choice partner for asset owners seeking to understand and control their global impact. Build your impact strategy with us - see inside for details. How sustainability standards can drive business performance How sustainability standards can drive business performance How can standards bring consistency and scalability to sustainability programmes? Corporate Social Responsibility Training and Staff Development Corporate Social Responsibility Training and Staff Development CSR Asia is the leading provider of training courses in the Asia-Pacific region. Global Compact LEAD Submission: Comments to the IIRC s Consultation Draft of the International Integrated Reporting <IR> Framework. While we acknowledge that implementing these guidelines may have additional costs to issuers, we urge issuers to follow them to the extent feasible. The GRI G4 Exposure Draft: What might it mean for corporate sustainability reporting?